After the chicken coop move had been completed I took a peek inside to look at my girls. The first thing I see is this big blood smear on the chicken feeder and my eyes about pop out of my head. So I go into the coop to find out what happened and expecting to see someone with a very bloody head. All I could find was a Bob that looked like it had a peck to the comb. 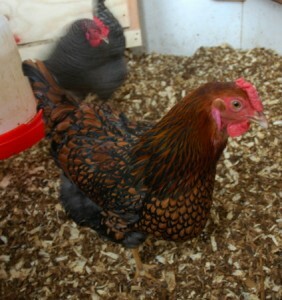 A lot of the Rhode Island Reds and the Barred Rocks has what looked like small peck scabs on their combs. I’m thinking that they REALLY are not happy with the recent confinement in the coop. Today would have been their fifth day in the coop. I can understand why big chicken places clip the beaks of their chickens if only five days brings out this sort of pecking. The only other thing that I can guess with what happened was maybe the chicken got hurt somehow in the latest move. Since so many of them seemed to have little pecks to their combs, due to what must be boredom, there was no way I could separate that many. Saturday they will be let out to forage finally and that will hopefully solve that. Today to help with the problem I put new bedding in, fluffed up their deep litter to make scratching easy, and sprinkled in about a quart of cracked corn on the floor to keep them busy. I will keep a close eye on them for the next week to make sure the problem doesn’t get worse. 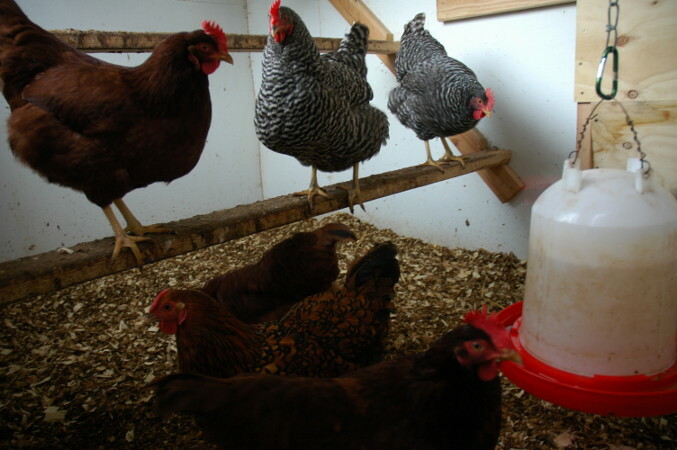 Robin – we trim our chickens’ beaks with a pair of nail clippers just to take the point off. We don’t make the top beak look like it got stuck in a paper shredder, like I’ve seen some people do. But that way it hurts less when they bite each other, at least we think so. Our chickens have been confined for many days, too, during all our bad winter storms this year. We got them a seed block, called a flock block, and put it in the coop to give them something to peck at when they are locked up. I also bought them a hanging wooden toy (supposed to be for a parrot), but they ignored it. Good luck with your ladies – at least they got to go outside today (Sat)! Well the chickens got out today so I think all is well again. I never heard of trimming the beaks with finger nail clippers. It that hard to do? The weather is never so bad here that the chickens aren’t allowed out. Which is probably why we never had them pecking on each other’s combs. That seed block sounds like it would be really handy in the chicken coop if they had to be inside more. Oh dear, this would have been worrisome. Hopefully they’ll do better, not that they can get out again.